At Marwood Hill there are over eighteen acres of landscaped gardens with a large collection of trees, shrubs, herbaceous and alpine plants. The gardens were started in the 1950s by the present owner, Dr Smart. At that time they consisted of a neglected walled garden and its immediate surround. Over the years many new areas have been planted and new features added such as the Folly and the Scented Arbour. Today, with many genera planted in close association (Eucalyptus, Betula, Sorbus, Malus etc.) and most plants clearly labelled, there is much of the botanic garden about Marwood Hill. The gardening year starts in February with masses of snowdrops welcoming the early spring. These are followed by daffodils and, later, bluebells. During March and April the collection of Magnolias is at its best, and together with Rhododendrons and cherry blossom, makes a riot of colour for Easter time. In May the alpines and early-flowering herbaceous plants begin to flower. Around the lakes and stream drifts of colourful Primulas are starting to give several months of colour. A large bog garden linked to the lakes is a haven for moisture-loving plants such as Astilbes, Iris, Hostas and Ligularias. A large pergola is covered with Wisteria, Roses and Clematis. During the summer months the areas around the walled garden are a mass of colourful blooms and the walls are draped with Clematis. As autumn approaches the hardy cyclamen around the bases of the trees start to produce their pink and white flowers, while above, the autumn tints of the trees' leaves give one last riot of colour. The garden is famous for its collection of Camellias, the largest in the country. A large greenhouse is planted with over one hundred big plants which in March and April are covered with flower. Three national plant collections are located within the gardens. 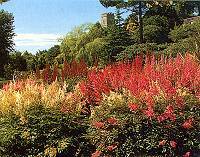 The Astilbe collection is one of the biggest in the world. In the walled garden is the Plant Centre, where plants propagated and grown at the garden may be bought. Many of these plants are rare and not often for sale at garden centres. The three lakes are home to many ducks and large fish. Nine miles from Ilfracombe and four miles north of Barnstaple. Follow the signs from the A361 Barnstaple to Braunton road.